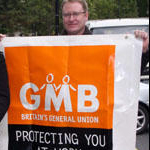 Before anyone gets overexcited about the 83.7% of GMB union members voting to strike, lets take a wee reality check. The turnout was a mere 33%. So in reality just 27.6% of the members voted to strike. Following one of your stories today, you may be interested to know that, as a UNISON member, the first I found out about the date of the ballot was when the results were announced on the news. I had not received a ballot, and I was not even emailed by a UNISON representative in order to alert me to the fact that a ballot was doing the rounds. Upon returning to work following the ballot results, I contacted my representative to be told that I “should have checked the website”. I protested that I did not have time to do this every day and further asked why it was that we were not emailed to inform us of the ballotting when the mass email system had been previously used for such major occurrences as that same representatives standing down from (and returning to) his position a year or two ago. I emailed my concerns onto the UNISON Head and Deputy Head of my organisation several days ago. Anonymity appreciated on this one please. I’m genuinely a little concerned about all of this and don’t want to ruffle any more feathers than I already have what with swingeing cuts and all of that malarkey.